Whenever you’re discussing the hierarchy of cheesesteaks, Philadelphia is certainly the King, but there are plenty of places in South Jersey vying for the piece of the crown as well. We took our time to try each one, seeking out spots known for not only serving up top-notch classic renditions, but also those who are redefining what a quality steak sandwich is. The 20 offerings on the list are proof that while we may not have invented the sandwich. We are doing our part to help perfect it. Renowned for their cheesesteaks (just ask anyone waiting in the seemingly ever-present line), this place isn’t big on the fuss, just solid traditional steaks prepared the right way. Earthy mushrooms and green bell peppers are sweated on the grill until they are in perfect harmony with the chopped beef and slid into a spongy roll that soaks up all the greasy goodness. Hey, it’s not always about the beef. Chicken cheesesteaks deserve their rightful place in the conversation as well, and we’re suckers for this one in particular. The chicken is melded with salsa and finished with two cheeses—Monterey jack and cheddar—and sliced jalapeños, bringing border cuisine to Philly’s beloved sandwich for a match made in heaven. When we stopped in Bagliani’s to stock up on cheese and antipasto one day, we didn’t anticipate we would also stumble upon one of the most satisfying steak sandwiches we’ve ever tasted. Angus ribeye is wet-aged for three weeks before it’s ready to be placed in a crusty seeded roll with fried onions and provolone. It sounds simple, but the proof is in every morsel of succulent beef that explodes with flavor. There are many loyalists who argue that you should never put ketchup on a steak—we’re on the fence about that—let alone a whole mess of toppings. This wonderful cheesesteak may not have the bells and whistles of some others, but don’t you dare confuse it with being basic. Friedonions and hot cherry peppers for a little zing is all you need as you savor every mouthful. A steak sandwich with a side order of onion rings? How run of the mill. At City Steaks, they combine the best of both worlds by putting the rings right into the sandwich, providing crunch and added textural balance that plays off the gooey American cheese. The added petal sauce only makes things more interesting. 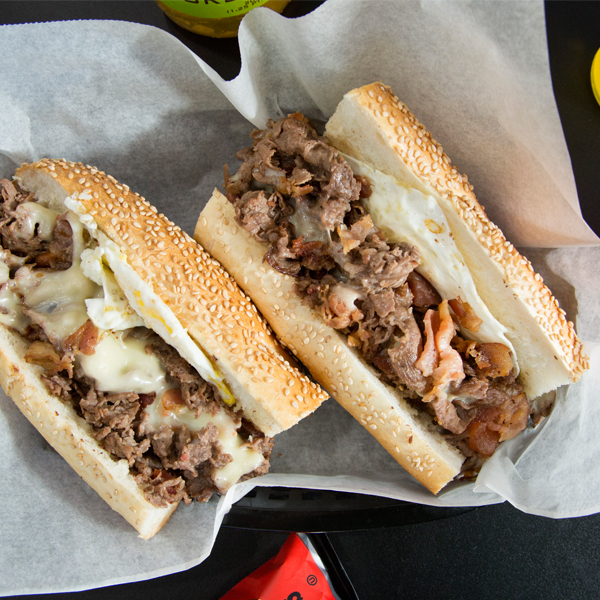 While we love this place for its seriously tantalizing barbecue, there’s no denying they also make some of the best cheesesteaks in South Jersey. Slow smoked ribeye is shaved and serves as the foundation for your choice of cheese along with applewood smoked bacon and ranch sauce. We weren’t sure at first about theranch on a cheesesteak, then we ate this and now there’s no going back. For our money, the pizza steak is too often over-looked but if there was ever a place to bring it to the forefront, it’s here. Stringy, delicate mozzarella cheese and the meat are perfect partners, but when you add in a slightly tangy sauce— made in-house—you’regoing to want to grab a few extra napkins and dig in. Fat Louie’s takes the idea of steak and eggs to new territory with this one. And while we admit, we’ve had some early morning cheesesteaks inside the Eagles parking lot, the thought of adding a breakfast element never crossed our minds. Thankfully, this place showed us the light by sliding in a fried egg next to the steak which is then topped with chopped bacon and melted cheese. This venerated deli cooks up more than a dozen specialty steaks, but if you want to sink your teeth into something truly mouthwatering, then look no further than this palate pleaser. Well-seasoned chicken steak is blended with sliced zucchini and then cloaked in tomato sauce before a touch of freshly grated pecorino is added, giving every bite an enhanced bit of smooth sharpness. There’s been a lot of debate on where Donkey’s fits in the cheesesteak conversation, especially after getting a ringing endorsement from the late Anthony Bourdain. It’s certainly different with its layers of steak and heaping piles of caramelized onions tucked into a round poppy seed roll, but there’s no doubt that it’s extremely gratifying and deserves to be on this list. This unassuming spot just along Haddon Avenue prides itself on having the “best Philly cheesesteaks anywhere.” Braggadocio aside, they have reason to be confident as their well-crafted steaks definitely raise the bar. Perfectly seasoned beef is chopped, butnot to bits, and slid into a Liscio’s seeded roll with your choice of cheese— even Whiz. While the Jug is known for attracting hungry throngs eager to chow down on their dynamite wings, any regular would tell you the steak sandwiches also reign supreme. This particularly exquisite steak comes with your choice of any one of their nearly 20 wing sauces (we suggest the Carolina Buffalo barbecue) and an appropriate proportion of blue cheese dressingmaking sure you don’t lose any of the other flavors as you try not to devour what’s in your hands. We don’t know Petey personally, but we like where his head is at with this distinctive cheesesteak. It all starts by adding provolone—the flavor of which only intensifies when melted—then topping off with bacon, lettuce and believe it or not, Russian dressing. It’s like three of our favorite sandwiches in one and there’s nothing wrong with that. Phil’s menu is full of sandwich options that sound like ideas concocted in the wee hours of the morning after a long night of indulging— and we absolutely love them for it. Perhaps one of the more tame items on the menu is also one of the most satisfying as this steak features melted mozzarella along with plenty of lightly smoky pepperoni and fried onions before being smothered in marinara sauce. A veggie cheesesteak? Seriously? Hey, if it wasn’t this good, we would agree, but even a devout carnivore would admit this passes the test. Marinated seitan— a wheat heavy meat substitute—and vegan cheese join more familiar friends like sautéed onions and long hots on a Sarcone’s roll for a steak that’s a little daring but irrefutably delicious. Known for their wood-fired pizzas and array of delectable pasta dishes, Speranza doesn’t cut any corners when it comes to their eponymous cheesesteak. Grilled shave steak and white cheddar cheese are topped with sliced fried onions while the seeded roll is dressed with a truffle mayo and the entire sandwich is finished with baby arugula. Worth the drive: Tony Boloney’s intrigues foodies with an array of menu items that emphasize pushing the boundaries all in the name of a little culinary fun. Take for example, this clever play where the steak is topped with a mushroom fondue made up of gruyere, emmental and raclette cheeses, sweetened with caramelized onions and made whole with a smear of roasted garlic spread. Long before Tony Luke’s expanded its footprint to several corners of South Jersey, you could find us regularly lined up along Oregon Avenue in the city waiting patiently for our turn to order up this steak. The sharp provolone provides a pleasantly piquant flavor that helps cut through the bitterness of broccoli rabe or sautéed spinach. Prior to this tiny hideaway being featured on Food Network it had a loyal following that has only grown with each sizzling steak that comes off the grill. Served on a pillowy, yet sturdy roll, with the right ratio of meat to bread, this chicken steak gets a boost of flavor by way of roasted red peppers and a smoky chipotle sauce.